It will be at the North Valley Academy from 10a to 3p. The card base is crumb cake card stock. (you aren't really surprised by that, are you?). The pink is the lightest pink I have, Blush card stock. 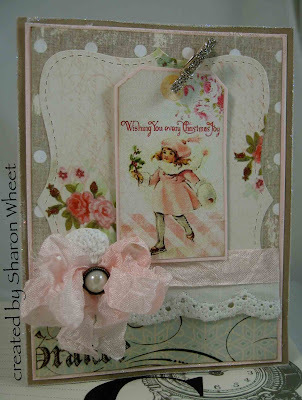 The grey polka dot pattern paper is from Glitz. The pale blue pattern paper is from Pink Paisley. The floral pattern paper is from Lost & Found. The vintage tag is a digital download that I purchased. I used foam tape to adhere the tag to the card front. I used a pearl brad from Reflections to attach the multi-loop bow to the card front. I also used the last bit of the white eyelet trim. I altered the tiny clothes pin with some silver fine glitter from Martha Stewart. Thank you for looking. I hope you have found some inspiration to craft something today for someone special!